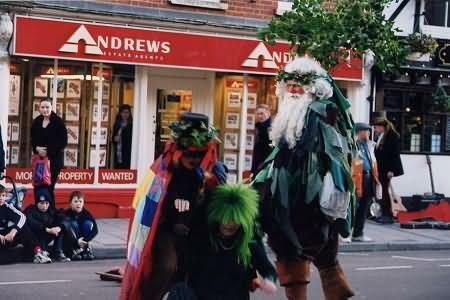 Guisers' and Mummers' Plays, are short traditional verse sketches performed at Christmas and other festivals, and taken round pubs and private houses in return for cash and refreshments. English folk play texts are mostly in rhyme, and they may include songs or even dances. The key character is the comical quack doctor, who is brought in to revive the loser of, say, the sword fight between a hero and an adversary. The heroes vary regionally and include Saint George, Robin Hood (in the Cotswolds) and in Scotland, Galoshin. The adversaries include Slasher (a soldier), Hector and the Turkish Knight. Additionally, there are a variable number of extra characters whose main purpose is to ask the audience for money, food and drink at the end of the performance. The most memorable of these characters is Beelzebub. The plays are often called Mummers' Plays after one of the common names by which the actors are known. However, Mummers is only one of the collective names used. Others are: Guisers, Christmas Rhymers, Plough Jags, Plough Bullocks, Tipteerers, etc - even Morris Dancers, although the actors may never have performed a dance. Contrariwise, there were plenty of Mummers who did not perform plays. It appears that this was always the case in Medieval times, but non-play Mummers have continued to exist in England, Newfoundland and Philadelphia right up to the present day. Nonetheless, Mummers Play is still a frequently used term, and it causes no end of confusion. England has a number of traditional plays performed exclusively by male non-actors (including female parts) from within the community, handed down in oral tradition with lost origins. These take a number of forms. 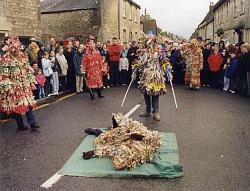 The traditional folk plays are known as 'The Mummers' Play' and are often based on the legend of Saint George. This is claimed by some as an ancient tradition but seems reliably to date back to the early 18th century. In fact the title describes a wide variety of plays handed down by word of mouth with varying forms and costumes. Mummer's plays are in fact mystery plays like the Christian ones of Medieval Britain with a cultivated air of strangeness. Mummers' plays are performed by males exlcusively in a bold, exclamation style without actorly pretense. Originally the players were drawn from the working class community in groupings, so for example the Plough Monday plays were performed by Plough Hands and so on. The performers carried on family participation handing down the roles on death or retirement. It was a matter of pride and continuity to take part within the family. The revived form of Mummers from the twentieth century onwards is typically more middle class in nature as it is a deliberate rather than spontaneous communal act. Mummer's plays are often comic in tone with a formal structure but allowing for many comic asides and there is an element of community celebration and humor in the performances. However the plays are not pantomine in nature and taken very seriously by the performers. Many of the costumes for the Mummers hide their faces and this acts as both increasing the mystery and liberating the performers around those they would know and love. This is consistent with the concept of 'guising', going in disguise as part of festivities. So masks, streamers, hats with strips hanging down and blackened faces are variously used to strange and beguiling effect. See text of the Robin Hood Mummers Play performed in South Cerney, Cotswolds. 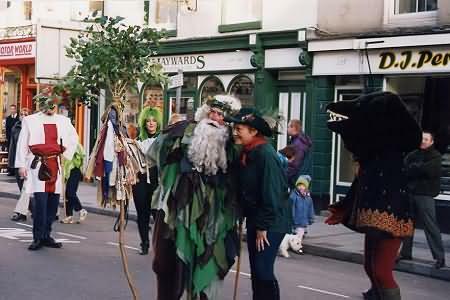 Links to Mummers Plays in Gloucestershire. At the Cotswolds village of Marshfield - Mummers, on Boxing Day, 26th December. A mumming play performed by the Paperboys, so-called because they wear costumes covering them from head to toe in paper streamers. They may have originally been made of leaves or skins symbolising the death and rebirth in nature. After the Christmas Hymns are sung and beginning at 11am, seven figures (seven was thought to be a lucky number) led by the town cryer and his handbell perform the play several times along the High Street beginning in the Market Place. In the 19th century the mummers may have been villagers who toured the large houses collecting money for village festivities, but there is some evidence that the plays were performed here since the 11th century.The play lapsed in the 1880s after many of the troupe died of influenza but was revived in 1931. The Revd Alford heard his gardener mumble the words "Room, room, gallant room, I say" and encouraged the surviving troupe members to reform. Perform outside Gloucester Cathedral - began in 1969 outside the cathedral and performed every year since. The members were given the text of the Gloucester play by David Todd who had researched and printed a pamphlet as a student. 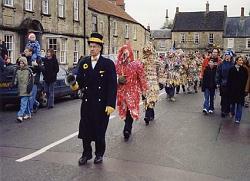 Laurie Lee was the Patron of the Mummers until his death. This troupe is unlike many others in that it is not exclusive to the members of Mumming families.